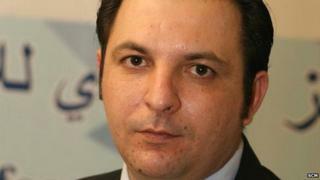 One of the most prominent human rights activists in Syria, Mazen Darwish, has been freed after spending more than three years in prison. The director of the Syrian Centre for Media and Freedom of Expression (SCM), he was arrested in the Syrian capital, Damascus, in February 2012 with two colleagues. They were accused of "promoting terrorist acts". His colleagues were released last month as part of an amnesty. Mr Mazen - who has been awarded a number of international prizes - is still facing trial and is due to attend a court hearing later this month. He was jailed for reporting on the government's crackdown on protesters in the early days of the uprising against President Bashar al-Assad, activists said.